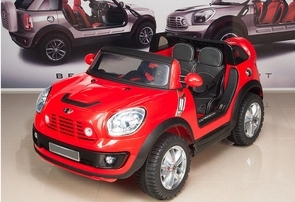 Fun electric Mini Cooper style ride on car 2 seater for kids is available in red, black, yellow, and white. Strong 12 volt power power system and holds up to 100 pounds, measures 52" long, 26" wide, and is remote controlled for an added effect. You have the option of controlling this ride on car via the included wireless remote control. Or let your child drive the Mini Cooper ride on style car by pressing the switch on the car itself giving the driver inside the vehicle full control. Drive forwards, backwards, left, and right with ease. Uses two powerful motors so you will not be bogged down by a under powered ride on car. Reaches speeds of 5 mph and arrives almost completely assembled. Buy today and you will get an upgraded rechargeable battery pack and battery charger. Want more? This ride on car has a working headlights, car engine sounds, mp3 input, real leather seats, and music too! Do not be fooled by imitators, only official Magic Cars® sold on TrendTimes.com come with the Best In Class 1 year bumper to bumper warranty for free! Guys! My daughter LOVES her new Magic Car! Thank you so much. Works perfectly!